This website was set up in 2014 to support teachers who want to employ the developing computer science pedagogy for computational thinking for programming in schools. Initially, this support was targeted at teachers of KS2/KS3 pupils but is now extending to KS4+. It’s early days, but give it a go on your laptop/ipad/mobile. We recommend you use a Chrome browser. We have been looking at making some of our open source software to help in the process of teaching and learning immediately accessible to teachers and pupils by putting it into browsers to run. By making the software responsive, it will be available on iPads and mobiles. We hope to have a simple trial model working for Christmas 2018. Watch this space. 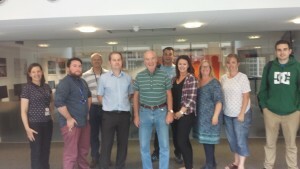 A number of structural changes to the website are in process supported by the Google Award CS4HS 2016-17 , which has enabled us to revise radically the KS2/KS3 Course for Teachers and Master Teachers asTao of Computational Thinking in Programming, which includes the innovative ISPY software as an aid to learning how to think computationally in the process of building programming solutions involving action geometry and pattern design in the 2-D plane problem domain. The expertise developed in devising this course has been extended to problem solving for KS3/4 Teachers and Master Teachers with data structures in the problem domain of the knight’s tour. A knight’s tour app has been designed to encourage computational thinking for human solutions en route to programming solutions. In order to improve the readability of the menus and to make downloads more accessible we have grouped all the repositories as sub items under the menu heading REPOSITORIES. All materials on the site are free to download, and the ‘License for Use’ conditions are stated at the foot of this page. Users are required to login in order to view or download most of the learning and teaching materials. Ubiquitous computing was yesterday’s dream that became today’s reality; computational thinking is tomorrow’s reality. The new development at UCL in the Course for Teachers of Computer Science of cross-curricula problem-solving with ISPY and Push-Python has received the Google International CS4HS Award 2016. We intend to have improved beta versions of the software available for download for training courses for teachers at UCL in New Year 2017. We are building a new package of push-button ‘unplugged programming’ software ISPY leading to the final push-button subset of Python 3, Push-Python. 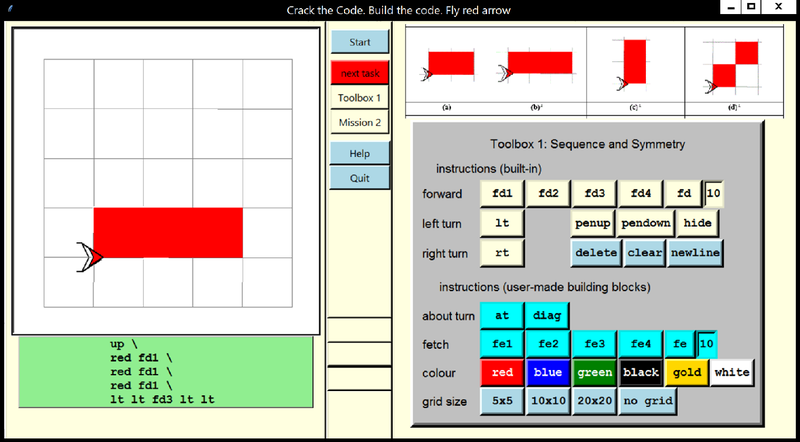 It is an integrated teaching and learning environment derived from the Xavier Seymour turtle or Scratch sprite, with Computational Thinking, creativity and experimentation in ‘unplugged programming’ at its heart, that offers : a series of 5 Toolboxes with no syntax errors, no error messages for pupils to deal with, no saving-and-running programs, in short, no IDE environment and therefore no ‘administrative error’ overhead for pupils or you. It is usefully preceded by sessions on ‘unplugged programming’ involving paper and pencil and ‘Walking the Talk’ as a robot. (Repository 1, Workbook 1). A snapshot is given below of Toolbox 1 in ISPY, with problems to solve displayed, illustrating ‘sequence’ and picking out symmetry in drawings ‘push-button programmed’ on the grid. This Course for Teachers designed and delivered at University College London has received the Google International CS4HS Award 2015. The primary aim of this website is to develop and improve the quality of teaching of Algorithms and Programming in Schools. 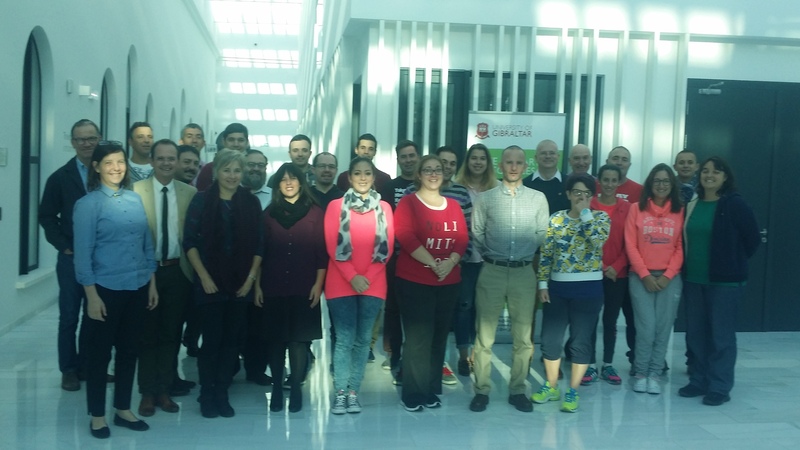 The site contains a series of ongoing Courses delivered at University College London as part of the CAS program for the training of Master Teachers in Computing. The Courses have been adapted to deliver quality Continuing Professional Development in Computing for Teachers at stages KS2 to KS4. The Course material is in the form of downloadlable workbooks for teachers and mission sheets for pupils. Further Development of the Website is under consideration as a result of the Google CS4HS 2015 award. harness and develop a growing Pedagogy of Computer Science based on action research in the classroom and other sources. make available a series of workbooks for teachers with accompanying mission sheets for students. The workbooks are arranged in sequence to form pathways through problem-solving in projects which introduce and make use of the 5 control structures of programming. their pupils to undertake cross-curricula subject learning, which at once, is engaging, enables creativity, experimentation and enquiry, is ‘do-able’ and challenges them to think, on the way to learning how to develop algorithms which they can then turn into programs. It is intended that the Algorithms and Programming Course Module 1 are/will be available as a series of Workbooks 1-20 (now) in Word and PDF formats to view and download from Repository 1 and 2. Each Workbook contains mission sheets with activities graded 0–5* to span the bands KS2 — KS4. It is important to note that Workbooks are in a developmental stage and currently being updated as a result of teachers’ feedback. Latest updated versions are notified in News It is proposed to re-launch the site early in Autumn term 2015 by which time we intend that the 17 of the 20 Workbooks in Module 1 will be available in fairly stable release versions. Feedback on any Workbook is welcome and amendments/improvements will be incorporated. Collaboration is invited and will be credited. Users are required to login in order to view or download most of the learning and teaching materials. Algorithms and Programming, UPL, Scratch and Python Workbooks and bespoke software at Dept of Computer Science, University College London is licensed under a Creative Commons Attribution-NonCommercial-ShareAlike 4.0 International License. Based on work at dave@ispython.com. Permissions beyond the scope of this license may be available at dave@ispython.com. This is a responsive website and therefore designed to be readable on most devices. It has come into existence to complement and contribute to the explosion of creativity in the building of resources and delivery of the New Curriculum in Computing (September 2014) initiated by the grass root members of Computing at School and the Network of Excellence Users of the site are recommended to join CAS.